Summer holidays are the perfect time to practice your favourite sport! 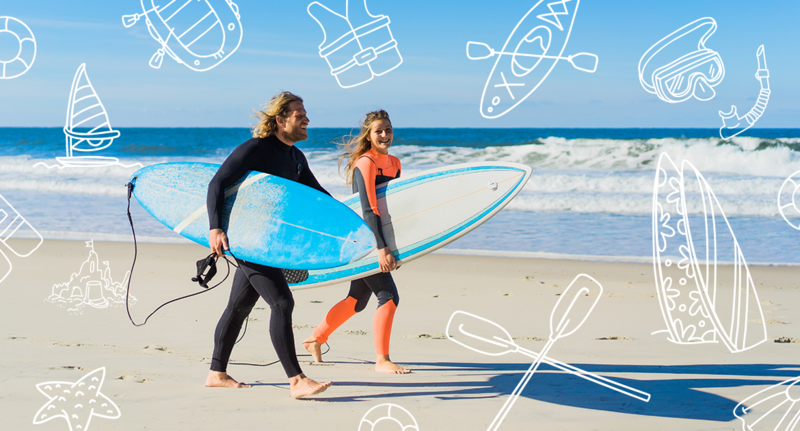 Luckily, whether it be golf, fishing, tennis or even scuba diving or surfing, you can take your sports equipment on board with Air Europa. We have put together a list of all the important things to consider if you are travelling with your sports equipment. Included in your free baggage allowance as long as weight conditions for class of travel are not exceeded. The baggage allowance includes a duffel bag with your hockey equipment (hockey sticks). Whether you enjoy fishing from the shore, pier, beach or cliff, Air Europa has you covered. You can bring two fishing rods, a fishing reel, a fishing net, your fishing boots and your fishing gear. Your fishing equipment is included in your free baggage allowance as long as weight conditions for class of travel are not exceeded. Air Europa helps you discover what lies beneath the oceans: you can transport all of your scuba-diving equipment with us and enjoy a stress-free journey while heading to your favourite diving destination. The equipment you are allowed to bring includes: diving suit, vest, socks, flippers, flashlight (batteries must be packed separately and always in your hand luggage), nets, knife, an oxygen bottle (which needs to be empty and checked in) and a diving regulator. Keep in mind that it is recommended to wait for a reasonable period of time before flying after going scuba diving. Not included in your free baggage allowance, additional cost of 75€. You can take your own bicycle on your next holiday destination with Air Europa. Each bicycle must be transported individually (including bike trailers or accessories of a similar size). In order for it to be accepted, the passenger must present the bicycle at check-in with the handlebar turned lengthways, its pedals and extensible parts removed or covered, and with its tyres deflated (the front wheel removed and attached to the frame). It needs to be suitably packaged in a bag or case. If you’ve chosen hang gliding as a hobby, you’ll already know that transporting your equipment between locations takes some planning: you will have to book this in advance, as bulky luggage needs to be transported in the hold. Not included in your free baggage allowance, additional cost of 150€. Unfortunately, transporting a kayak or canoe with Air Europa is not permitted due to space restrictions. You can, however, bring your paddles as long as the dimension does not exceed 62 inches (158 cm). – Windsurfing: The equipment may consist of a surf board, mast, sail and boom. – Kitesurfing: A kite or parachute, a paddle and a board. All sports equipment must be protected and packed in the appropriate casing. Air Europa makes it easy for you to bring all your ski equipment: if you opt for traditional skiing, your baggage allowance includes a pair of skis, two ski poles and your snow boots. If you prefer jet skiing, you will be able to bring your slalom or conventional jet skis. All the equipment, however, needs to be properly packed in the appropriate casing. Should you have any other questions with regards to taking sports equipment on board please drop us a comment below. We look forward to welcoming you on board!